Compare and merge XML files. Developer website: SyncRO Soft SRL. Is there a better alternative to Oxygen XML Editor? Is Oxygen XML Editor really the best app in Developer Tools category? Will Oxygen XML Editor work good on macOS 10.13.4? Note: Now requires OS X 10.7.3 or later. Oxygen XML Editor needs a review. Be the first to review this app and get the discussion started! Oxygen XML Editor needs a rating. Be the first to rate this app and get the discussion started! 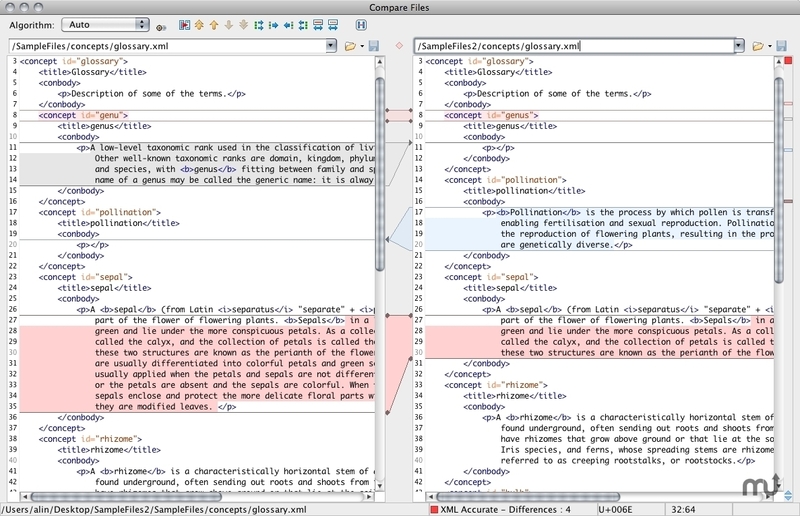 Oxygen XML Editor (was oXygen XML Diff) is a complete solution for comparing and merging XML files. It offers both directory and file comparison, six different diff algorithms and multiple levels of comparison. The comparison is also performed inside ZIP-based archives (ZIP, JAR, ODF, OOXML). The diff solution includes two XML diff algorithms (XML Accurate - tuned for precise compare and XML Fast - tuned for speed at the expense of some accuracy), one Syntax Aware algorithm that gives very good results on all file types known by oXygen XML Diff and three algorithms that rely on the file structure: line based, word based and character based. The XML diff algorithms are designed to help with the necessities that come with XML document comparison. This means that you can specify if namespaces, prefixes, namespace declarations, processing instructions, comments, CDATA, DOCTYPE, the order of attributes or even text elements should be ignored or not. When performing a diff between directories/archives the files can be compared by several methods: by timestamp (only the file date and size are compared, fastest method, this is useful when the directories contain a lot of different files), by content (the file content is compared using the default diff algorithm and depending on the selected algorithm the appropriate options will be considered, like ignoring the whitespaces, ignoring the namespace prefixes in case of XML, etc. ), binary comparison (the file content is compared byte with byte, this is faster than the content method but should be used mostly when any difference is of importance). oXygen XML Editor 18.1 allows you to insert media objects, play audio, and display video directly in the Author visual editing mode and includes updates to the publishing workflow to handle video and audio objects in the output. A new Markdown editor allows you to easily write, preview, and convert Markdown content into HTML or DITA and you can use Markdown-encoded topics in DITA maps. When validating a DITA map, oXygen is also able to validate Markdown documents and transform them in the publishing stage. Checking for and merging changes is made easier with the new 3-way directories comparison tool and the addition of more syntax-aware diff algorithms. You can publish the tracked changes and comments made in DITA documents to PDF output, thus allowing you to have the review information that is captured in oXygen also available as PDF. The responsive WebHelp system received numerous updates, including new skins, support for expanding/collapsing components (sections, tables, etc. ), automatic image scaling, support for DITA 1.3-specific context sensitive help information, and control over what is indexed for searches. Content completion for XPath and XQuery was improved with new proposals from XPath 3.0 and XQuery 3.0 specifications. As usual, oXygen also added many new API and component updates for this release.